Now, don't go out searching the web for what a GONAD is, I didn't know what it was either. I didn't know there was a whole club of GONADs out there. I didn't know it existed until I ran into this tweet in Twitter. (BTW, if you think I'm connected to Twitter all day long, you are wrong!! I subscribe to Twitter search results via my feed reader ). 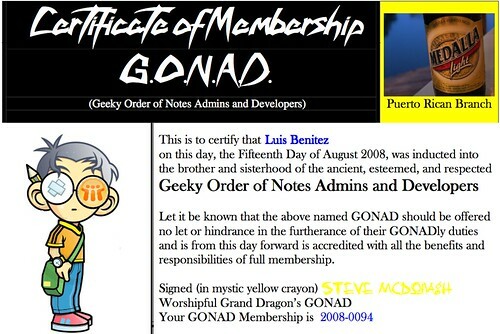 Anywho, after meeting @dominoyesmaybe , and expanding my social network, I was able to figure out what GONAD was: Geeky Order of Notes and Domino administrators!! "Phew!!!" I thought, I had done some searches on the web and the results weren't pretty! Thus I'm hoping that Google would crawl this blog entry and "change" the definition of a GONAD . I thought it was pretty cool how they included a picture of a Medalla bottle, a local beer in Puerto Rico. That is very original. Now I have to print it, and put it somewhere in my home office .